Michael Taylor Designs – WHAT IS JAMES WEARING? The use of symmetrical pairs is an effective and fundamental decorating technique for lending an area weight and importance. 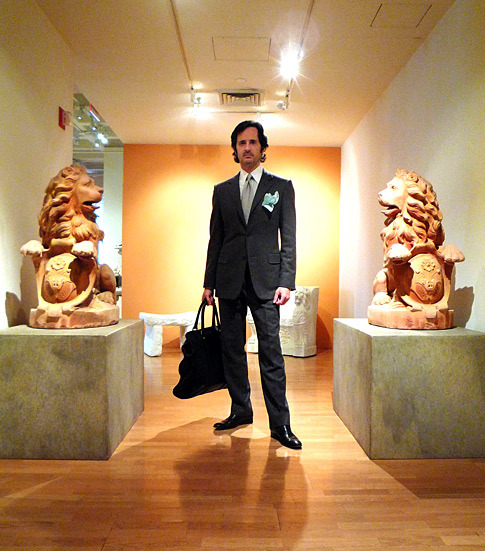 Pictured here are a powerful pair of terracotta lions that help to create a suitably grand entrance to the uber chic Michael Taylor showroom. The background color is a special formulation designed exclusively for the Michael Taylor showrooms – Farrow and Ball’s Fowler Pink is the perfect match to this very versatile color. I’m wearing a gray flannel suit by Gucci, a custom made Charvet Paris shirt in mint green and pale gray striped cotton with contrast white collar and cuffs and a mint green silk pocket square, a Gucci gray silk tie, Seaman Schepps black pearl cuff links, Yves Saint Laurent black leather “Windsor” loafers, black leather Gucci tote. Diana Vreeland dubbed Michael Taylor “the James Dean” of interior design. Taylor was larger than life, and his highly individualistic character was reflected in his interiors – mixing formal, modern. rustic, and antique pieces to create a casual and eclectic elegance. His legacy still carries on through Michael Taylor Designs where many of his iconic pieces are still produced – like the fabulous “Kempner Bed and Canopy and the Frog Chair” that I am pictured with. Admiring this wonderful collection of Michael Taylor furniture, I am wearing a nail head tweed jacket and yellow cashmere turtleneck sweater both by Gucci, Tom Ford black and white silk pocket square, Diesel black skinny jeans and black suede and leather trimmed Gucci loafers. With a mix of sunny open-air informality and 30’s movie-star glamour, Michael Taylor epitomized the “California look” in decorating. Taylor saught to create a “contrast that brings things excitingly to life.” Fusing a very personal vision with a refined set of influences that inspired him, it is no surprise that his beautiful designs are still available today at Michael Taylor showrooms. Here you can find a selection of well crafted, sophisticated furniture, that continues to convey Taylor’s unique intensity and passion for design. 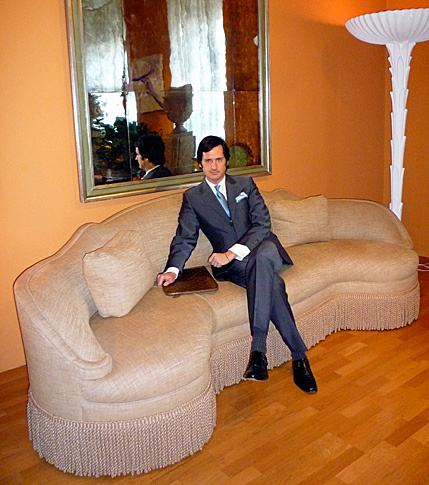 I am pictured seated on the “”Schiaperelli sofa,” with a silvered glass mirror and palm torchiere wearing a slate gray wool mohair suit by Gucci, white on white stripe cotton shirt by Tom Ford, silver pearl and pale blue sapphire cuff links by Seaman Schepps, turquoise pale blue tie by Gucci, pale blue silk pocket square by Charvet, Hermes black leather belt, Gucci black leather buckle shoes, and a Louis Vuitton document folder.